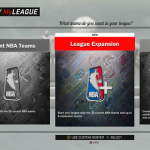 As I mentioned in last week’s Friday Five, one of my goals for NBA 2K17 is to return to my roots as a franchise gamer, and spend a lot more time in MyLEAGUE. I’m still deciding which team (or teams) I’ll control, what kind of moves I might make, and whether or not I’ll experiment with league expansion and relocation in my primary MyLEAGUE game. As I mentioned in this thread, I generally prefer to maintain a certain level of realism when I play franchise modes, as I’ve discovered that making too many trades or using the fantasy draft options quickly leads to boredom, due to the more rapid departure from reality. Of course, the very nature of franchise modes means that there will generally be some deviation from reality. Whether it’s a player’s stats, a team’s record, or the odd trade here and there, most of our franchise games are not going to be one hundred percent realistic. For many of us, it’s those small changes – or if we so choose, big changes – that make franchise modes so fun and enjoyable. 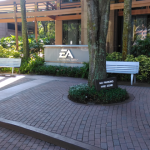 At the same time, however, many of us do believe that franchise modes should be as realistic as possible, and are frustrated when our desired level of realism isn’t achieved. 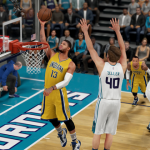 The question is: what actually constitutes realism in a franchise mode? I’ve said it before, and I’ll say it again. We have a good thing going here at the NLSC, especially when it comes to our modding community. 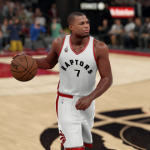 Although the changes to the file formats beginning with NBA 2K15 PC have presented some challenges, our community remains dedicated to creating some outstanding mods. Fantastic work is also being done to keep old favourites up to date, and breathe new life into the retro basketball gaming experience. We can be proud of the work we do here. Of course, every hobby or “scene” has its issues, and modding is no different. I’ve written about some of those issues in previous Monday Tip-Off and Friday Five articles, because I do want to see our community continue to get better and better. 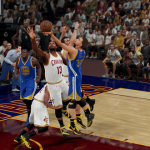 With the release of NBA 2K17 and a brand new season of modding looming on the horizon, I thought that I’d dive deeper into the reasons behind some of the rules and procedures in our modding community. This week, I’d like to discuss an issue that came up just the other day, which I realised we’ve never really explained in detail: why we don’t charge for mods. 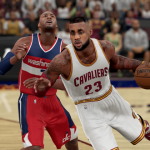 By now, you’ve probably heard that NBA 2K17 will feature revamped shooting controls on the Pro Stick, with the angle of the stick now determining whether or not your attempt is on target. 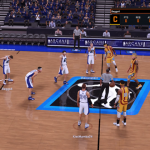 While many of the early impressions suggest that it’s not as complex as it may sound, it’s something that basketball gamers will ultimately decide for themselves upon getting their hands on the game. Fortunately, for gamers who prefer to use the Shoot button, Mike Wang made it clear in his developer blog that it’s still going to be a viable option in NBA 2K17. 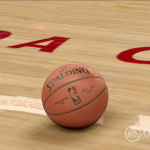 One of the things that made it difficult for me to get into the NBA 2K series all those years ago was its controls. I was accustomed to dribbling controls on the right stick, I didn’t care for the original approach to Isomotion, and I felt like the Shot Stick was overkill. With the Shot Stick becoming the Pro Stick in recent editions of NBA 2K, combining dribbling and shooting controls, I’ve definitely warmed up to the concept. However, when it comes down to it, I still prefer using the Shoot Button. With the changes in NBA 2K17, I now find myself wondering if I’ll change my approach. 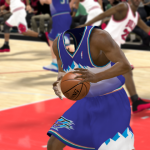 A few weeks ago, I talked about having fun with glitches in basketball video games. I posted a video of an amusing glitch that occurred while performing a mid-air adjustment with Stephen Curry’s layup package, which saw the ball zoom off the screen before dropping straight back down and through the hoop for two. Since then, I’ve been able to trigger the glitch on more than one occasion. Quite often, the result is just an unrealistically high arcing adjusted shot, but a few times the ball has once again rocketed off the screen, presumably into the rafters. To date, I’ve only encountered and tried to trigger the glitch while shooting around on Arcane’s MyCOURT, but I’d love to make it happen in a game of 2K Pro-Am, just to see if it does occur elsewhere. Whenever it has happened while shooting around in MyCOURT, I’ve made sure to capture a clip, which has allowed me to put together a short reel that I’d like to share with you today. Watch the compilation below, or check it out here on our YouTube channel if you can’t see the embedded video. If you’d like to try and trigger the glitch yourself, I’ve had the most success pushing straight up on the right stick to execute one of Stephen Curry’s high arcing layups, and then hitting the Shoot button to perform the mid-air adjustment. However, simply using the Shoot button and pressing it again to adjust the shot has also worked. While glitches like this aren’t exactly what we or the developers are hoping to see, they’re certainly amusing, and fun to try out. 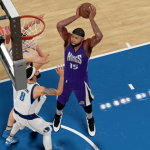 As I said, I’d love to make the glitch happen in actual game of 2K Pro-Am. I have to imagine that doing so and making the shot would likely induce a ragequit; perhaps a justified response, in this particular instance. 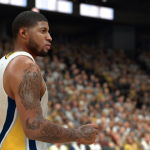 At long last, we’re on the verge of getting trailers and substantial information on NBA 2K17! It’s been a quiet preview season, with gamer frustration coming to a head on social media last week following some ill-advised trolling by 2K community representatives. Many of us have been frustrated at the lack of news and previews, but with less than a month until the Early Tip-Off Weekend, it would seem that the wait is finally over, as the first gameplay trailer is reportedly set to be released this week. Without much in the way of news, all we’ve been able to do is wish, want, and speculate. 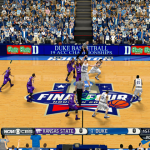 Even in the busier preview seasons of years gone by, a significant part of covering basketball video games has been wondering what if, and talking about what we want to see. When there is news, it’s going to be posted and analysed. 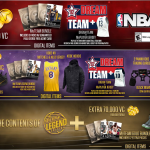 Should anyone that’s producing basketball gaming content secure some kind of an exclusive – a tidbit of information, a developer interview – they’re obviously going to push and promote it, us included. All content creators want to build their audience and brand, but there’s an underhanded way of doing so. It’s the bane of the Internet, and the basketball gaming community is certainly not immune from it. Today, we’re talking about clickbait. Monday Tip-Off: When Is It Time To Shelve Basketball Games? Last Friday night, the regular NLSC 2K Pro-Am crew got online to play a few games, as we usually do. As we’ve mentioned on the NLSC Podcast, and in the Forum, our record isn’t exactly stellar across our three Pro-Am teams, but we still enjoy getting in some games each week, picking up the occasional win here and there, and joking around on the party chat. We started our most recent session in high spirits, but after only a few games, we were feeling disenchanted and ready to call it a night. I’m sure that Arcane, Kenny, and I will discuss it in more detail on this week’s Podcast, but in short, it was one of our worst sessions of 2K Pro-Am. Aside from our own mistakes – and the usual MyPARK cheese that spills over into 2K Pro-Am – we really seemed to be battling some gameplay quirks in all three contests. I can’t speak for the rest of the guys, but when we decided to call it a night early, I found myself wondering if I wanted to keep playing 2K Pro-Am in NBA 2K16. Mulling that over led me to ponder another question: when is it time to shelve basketball games? Although glitches are generally seen as a problem in gaming – and for good reason – they’re not always a bad thing. Sure, they aren’t a lot of fun when they cause games to crash and lock up, or ruin features and functionality, but when glitches are relatively harmless, they can be pretty funny. I wouldn’t say that it’s as common in basketball video games as it is in other genres, but there are even times when bugs and glitches can be advantageous, making certain tasks easier, or even completely bypassing difficult and tedious sections of a game. TV Tropes calls them Good Bad Bugs, and the speedrunning community obviously knows them very well. A lot of people are probably familiar with the “Jesus Bynum” glitch that drew a lot of negative attention to the NBA Elite 11 demo. Although most people probably never experienced the glitch for themselves, it became a symbol of the game’s problems. While NBA Elite 11 was shaping up to be a disappointing game for other reasons before it was ultimately cancelled, the Bynum issue is really more of an example of a glitch that is fun and amusing; something weird that obviously shouldn’t be happening, but certainly funny when it does. With that in mind, I thought I’d talk a little about some amusing glitches today, and share a few of my favourites. The 2016 NBA season is in the books, as the Cleveland Cavaliers made history by coming back from a 3-1 deficit to defeat the Golden State Warriors, putting a damper on the Warriors’ own historical campaign. For basketball fans – or at least, those of us who are mostly interested in the NBA – so begins the wait until next season, with the Draft, Summer League, and potential offseason movement breaking up the monotony along the way. With the Olympic Games being held this year, we’ll also get to watch another international basketball tournament. 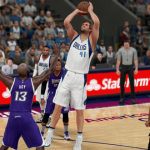 For those of us who are also basketball gamers, we have a few things to look forward to as well. It will be some time before we hear anything about NBA Live 17, and we likely won’t hear much about NBA 2K17 for at least a couple of months yet, but nevertheless, we have a new game coming out in September. Until then, we obviously have several years’ worth of games at our disposal, which can help us get our basketball fix while we wait for the new releases, and the 2017 NBA season.